Those audiences have been world wide for so many years. Mason noted that he’s done more Command Performances for the Queen of England than any other American comedian, and that he was soon on his way to London to do so again. Mason said he wanted to try some new material for his London trip for us on this night. He clutched some rolled up sheets of notes in his hand to refer to. One of Mason’s old standby topics that’s most humorous is his commentary on status in general and specific status symbols. He’s had an ongoing issue with Starbuck’s, for example, saying that he finds their coffee tasting burnt, and why should it be as expensive as it is to get that in a cardboard cup? Mason says that millions flock to the ubiquitous Starbuck’s because it makes them feel more important, as Starbuck’s is seen as the hip place to go. He further made his point regarding status by noting that a $300,000 Lamborghini car is about the most uncomfortable place for one to sit, being very small and low to the ground with no leg room, yet it’s viewed as a quintessential status symbol. He then scrunched up his face and body hilariously and joked that when someone goes by in a $12,000 Chevy while very comfortable and they wave at you in your astronomically priced Lamborghini, you can’t even wave back because you’re too contorted and squashed into its seat. There was also humorous but risque dialog about hookers and their customers, with Mason showing that even in his mid 80’s, virtually nothing is off the table to joke about. 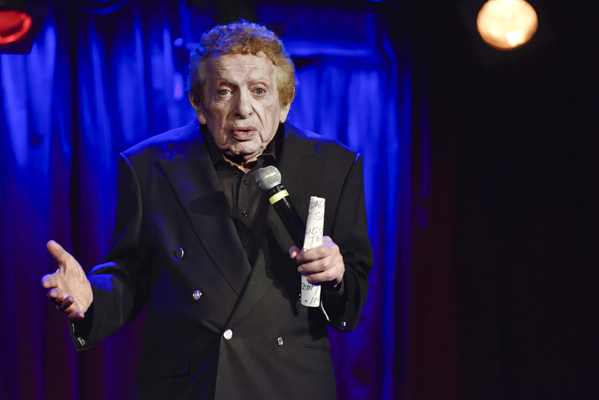 I’ll leave you to hear this part of his act for yourself, along with loads of other bits that make Jackie Mason one of last living comics, writers and minds that harken back to the Cold War era 1950’s still making audiences grab a napkin to dry their eyes from laughing so hard. And with laughter doing a body and soul much good, Mason is a very sound investment.